Native American Symbols, like the Hand Eye symbol, can vary in meaning from one tribe to another and across the culture groups of North America. The Hand Eye symbol was used by the ancient Native Americans of the Mississippian culture. Discover facts and information about the meanings of secret and mysterious symbols used by Native American Indians in our List of Symbols including the Hand Eye symbol. Native American Indians were a deeply spiritual people and they communicated their history, thoughts, ideas and dreams from generation to generation through Symbols and Signs such as the Hand Eye symbol. The origin of the Hand Eye symbol derives from the ancient Mississippian culture of the Mound Builders of North America and were major elements in the Southeastern Ceremonial Complex of American prehistory (S.E.C.C.). The Hand Eye symbol featured strongly in the Mississippian culture. The following picture shows the Hand Eye Symbol surrounded by the Horned Serpent. The meaning of the Hand Eye is obscure, its true meaning has been lost in the midst of time. However there seems to be a common belief that the Hand Eye symbol is related to gaining entry to the Upperworld (Heaven), in other words a portal. A portal is a magical doorway that connects two distant locations and provides an entry point from one world to another. The Eye-in-the-Hand symbol is believed to be representative of a supreme deity and is solar (and therefore Upperworld) in origin. To reach the Upperworld the deceased had to undertake a journey along the Path of Souls, the Milky Way. The Hand Eye motif is one of five symbols that often appear together in Mississippian iconography. The other symbols are a skull, bones, panther and serpent. The skull and bones symbols represent death and the Panther symbol and the Great Serpent Symbol are icons of the Underworld and depicted as fearsome monsters. On the journey of the dead along path of souls, the milky way, the demons of the Underworld had to be avoided to gain entry to the Upperworld (Heaven). The Algonquin people believed that crossing a bridge in the shape of an enormous serpent would lead to the road of the afterlife. All those who had led and honest life would cross the bridge but others would fall into the waters below and turn into serpents. Our grasp of Mississippian symbolism is only rudimentary. Their true meanings can never really be known and the meanings of the symbols are based on best guesses. 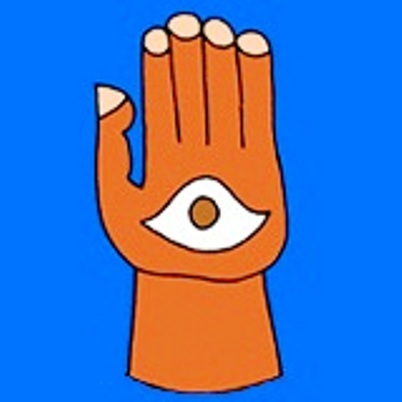 Our conclusion and best guess is that this Mississippian Hand Eye symbol would have been recognised by the Mississippian people to symbolize the journey along the Path of Souls and their ultimate goal of achieving eternal happiness in the Upperworld.